Last year I reviewed a new line of 12″ action figures that was exclusive to Toys ‘R’ Us. Sentinel 1 consisted of four guys, Bandit, Shadow, Wolf and Barracuda, which were decently made psuedo-military figures for the price (ten bucks, with frequent sales making them even cheaper) and had lots of potential as a toy for kids and also for customizers. The clothes were molded-on (except for vests and headgear), but they were a pretty cool entry-level toy for adult collectors who want to brainwash their children or grandchildren into like the original GI Joe. 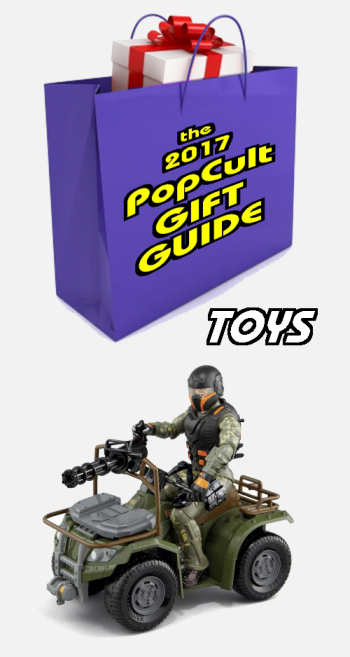 This year they have expanded the line by adding a new figure who comes with the first vehicle in the line, and that is our next pick in the 2017 PopCult Gift Guide. The True Heroes 12 Inch Mudslide Figure and ATV Playset is available exclusively from Toys’R’Us. It’s a fully equipped vehicle with a hidden cannon, rugged wheels and a weapon rack.The figure has 11 points of articulation, and wears a removable helmet and vest. The vest and weapon snap on to the ATV so he can speed away onto his next mission. The figure’s name is “Mudslide,” and Mudlside wears a removable helmet and vest. This has great play value for kids who still have enough imagination to play with real toys, and it’s a good gift for the adult collector who may not realize that the market for 12″ action figures is staging a bit of a comeback. Even if you hate the figure, the ATV is perfect for GI Joe, Action Man, Captain Action or Johnny West. You could even repaint it in space colors for Captain Lazer. Best of all, the entire set is only twenty bucks, and you might luck out and encounter a sale or special as Christmas approaches. The True Heroes 12 Inch Mudslide Figure and ATV Playset can be found at Toys ‘R’ Us stores and on their website, and it’s not a bad value for the price.